The man was attempting to flee down Sunset Hill on eastbound I-90, then lost control while trying to exit at Maple Street. He drove into the intersection at 5th Avenue and Maple Street, where he took out signs, shrubs, trees and a power line. SPOKANE, Wash. — A man was arrested for DUI and felony eluding on Friday morning after attempting to flee from Washington State Patrol troopers. Officials said Athos J. Turner, 30, of Arizona attempted to flee down Sunset Hill on eastbound I-90 in a white Pontiac G6, then lost control while trying to exit at Maple Street. 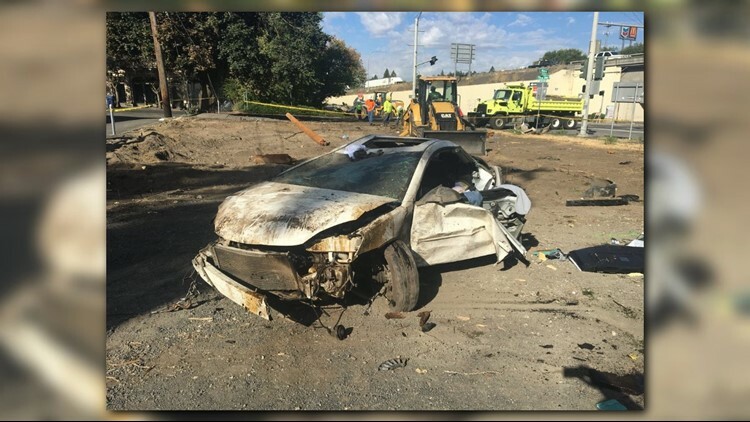 His car rolled into the intersection at 5th Avenue and Maple Street, where he took out signs, shrubs, trees and a power line, according to Washington State Trooper Jeff Sevigney. Trooper Corkins is launching a WSP drone to quickly map the scene here at 5th and Maple St.
Officials said the man tried to get out of the vehicle with the help of a passerby before attempting to flee the scene of the crash. Police quickly apprehended him. Turner was transported to Deaconess Hospital for his injuries. Additional charges are pending, officials said. 5th Ave and Maple St remains blocked for crash after vehicle attempted to flee a traffic stop. No serious injuries. The lone occupant is in custody.